Established in the year 2010, we 'RKB Enterprises' are a prominent name engaged in the domain of manufacturing and supplying a quality assured range of Metal Sheet Pressed Components. Our product range comprises Pressed Components, Sheet Metal Assembly, Precision Sheet Metal Components, Sheet Metal Stampings and Sheet Metal Drawn Components. The products offered are manufactured using latest machines and advanced technologies. Our products are stringently tested on various parameters by our quality auditors. These are highly acknowledged for their dimensional accuracy and durability. Our firm pays high attention towards the satisfaction of the clients and therefore, provides only quality products. With the help of our quality-testing unit and expert professionals, we strive to provide flawless products. Further, we ensure on-time delivery of the products through our effective distribution network. In order to provide maximum benefit to the client, we offer them various payment modes and provide immediate response to their queries. Under the notable guidance of our mentor, 'Mr. Kiran B. Nagpure' we are climbing the ladder of success. His wide experience, business and managerial skills have enabled us to achieve tremendous success in this competitive market. Manufacturing and Trading of Pressed Components, Sheet Metal Assembly, Precision Sheet Metal Components, Sheet Metal Stampings etc. We are counted amongst one of the reputed manufacturers and suppliers of a quality assured gamut of Sheet Metal & Press Components. These are manufactured using quality grade raw material and components. The quality inspectors of our firm test the quality of our products on various parameters, before the final dispatch. Our products are highly appreciated for their features such as durability, high tensile strength and resistance to corrosion. We have an experienced team of professionals and they are focused on enabling remarkable growth for the organization. Our team members are highly experienced, committed, dexterous and hard working. They are selected on the basis of their skills and qualifications. They have created a benchmark in their respective departments by thriving for success. Our professionals are in tune with latest generation techniques as we organize seminars and workshops for updating their skills. Our team consists of technicians, administrators, quality controllers, engineers, warehousing personnel, transportation experts and packaging personnel. We are among the acclaimed names in the industry for offering superior quality products at cost-effective prices. Our professionals are dedicated to the customers and have enabled us to offer a wide range of products. We have access to high capacity machines for maintaining the industry standards and the requirements of the clients. 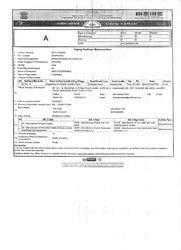 Our organisation is having NSIC certificate to participate in tenders of various government as well as private sector. We have 20 ton to 250 ton capacity of press machines. 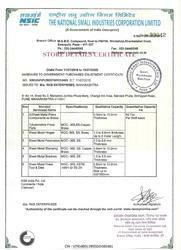 Our organisation is having MSME cerificate under Micro scale firm.